Enjoy a gourmet dinner and intimate performances from some of entertainment’s brightest stars! 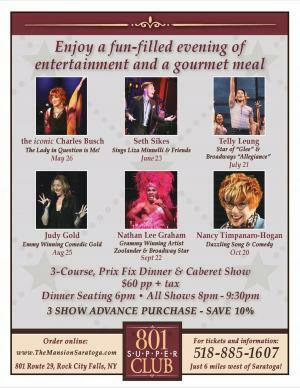 This year The 801 Supper Club is pleased to present six unique talents. We open the season with the iconic Charles Busch drag legend, film & Broadway star in a one “women” show filled with camp, comedy, song and claws. From the television hit “Glee” and the Broadway hit “Allegiance” spend an evening with the amazing talent of Telly Leung. Seth Sikes is taking the cabaret scene in Manhattan by storm singing the song book of Judy Garland and Liza Minelli – He brings Liza to the 801! Comedy = Judy Gold & Comedy, Cocktails and Dinner with Judy Gold will be heaven. Nathan Lee Graham can be Hollywood, he can be Broadway and he can win a Grammy with his massive musical talent. If you missed him in “Zoolander” or Pricilla Queen of the Desert” – Catch him at the 801. How cool is it to have our very own national talent closing our season. Nancy Timpanaro-Hogan is simply a force that with comedy, song and one amazing heart leaves sell-out audiences screaming for more!